R.A. Shatnawi, L.H. Etzkorn, and W.E. Hughes, Jr. 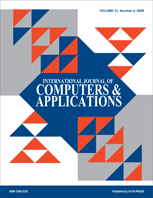 This journal covers all aspects of contemporary computers and their applications including technology, hardware and software systems, parallel and distributed computing, networking and communications, pattern recognition, artificial intelligence, computer graphics and multimedia systems, the Internet, as well as computer applications in engineering and science. First published in 1979 under the title International Journal of Mini and Microcomputers, this journal has been merged with the International Journal of Parallel and Distributed Systems as well as Microcomputer Applications to form its present focus. Adapting to the rapidly advancing field of computer technology, this publication provides the latest thinking from top researchers in the field relating to computers and their applications. It appears quarterly.